There are a couple of motels and campgrounds at the park. However, I personally found better value options in nearby Klamath Falls. If you follow my Instagram page and travel blog you’ll know I regularly use the fish eye lens. When photographing Crater Lake, I highly recommend this lens. The combination of a circular lens combined with the circular crater works perfectly. Alternatively, a wide angle lens would also work well. However, the most important thing about Crater Lake is the weather. If you are lucky enough to visit Crater Lake on a clear day like I was, you’ll be rewarded by one of the most beautiful views on earth. 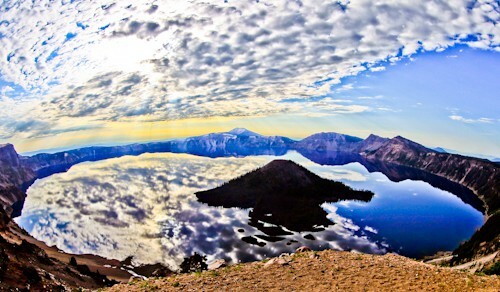 This incredibly beautiful view will be hidden though if you visit Crater Lake on a cloudy day. Because our American friends like to provide a great service they have set up a webcam so you can see the conditions before visiting. The large island is called Wizard Island and the smaller island is called Phantom Ship. An interesting Crater Lake fact is that there are 7 trees on Phantom Island. Something else to look out for is the ‘old man of the lake’. The ‘old man’ is actually a tree stump which has been floating vertically in the water for over 100 years. I would be very impressed if someone saw the old man in the huge lake and photographed it. Around the lake you’ll see many squirrels. They are very friendly as I’m sure they get fed well by visitors. 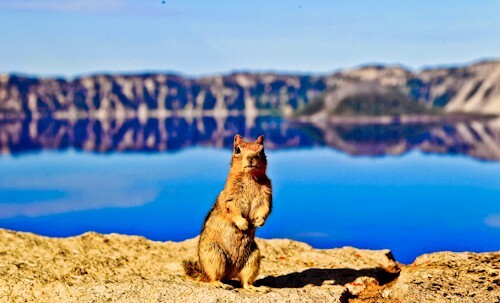 If you like squirrel photography they like to pose in front of the lake! From Crater Lake I headed North on I-5 towards the famous Mount Rainier. For me part of the fun of driving in the US is getting a photo of the state signs. Another part of the fun is visiting one of the thousands of fast food restaurants you’ll pass on the interstate. I drove 6 hours on I-5 North before stopping at Kelso, Washington which offers great value hotels close to Mount Rainier. 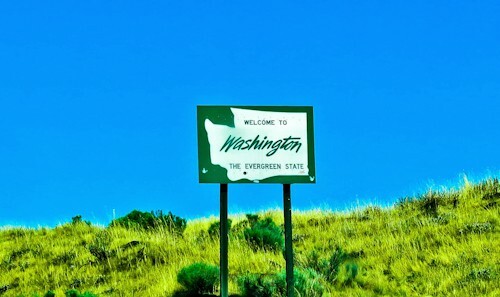 I am definitely going to spend some time in Washington/Oregon over the next year or so I will put this on my list. Its all so beautiful and amazing! Whenever I travel I always try to squeeze in a visit to a National Park. 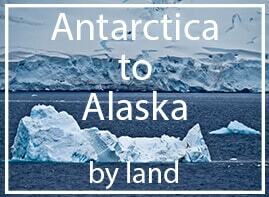 As a huge wildlife & mountaineering fan, I always enjoy reading posts about a destination I could see myself visiting. As both Crater Lake and Mount Rainier are close to Seattle and Vancouver Island, where I’m heading next, I might pay this park a visit! I can also see your fascination with snapping photos of various state sign when crossing over state lines, I have a curious little collection of those! Okay, this is definitely going on my Instagram bucket list! Would love to get here sometime, although it’s a bit far from me. Hope I get to go one day! I can’t believe I live so close to this lake and I’ve never been! We’ve flown over it a few times but I had no idea it could be so gorgeous from the ground. I hope I get a chance to squeeze in a visit this summer. You are making me miss the PNW. We usually head out that way each summer. It’s been a long time since I’ve been to Crater Lake — more than 20 years! — but I can still picture it clearly (your photos help, too!). 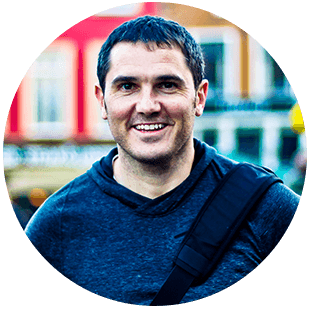 Good tip on staying in Klammath Falls. I always take pics of the state signs, too! 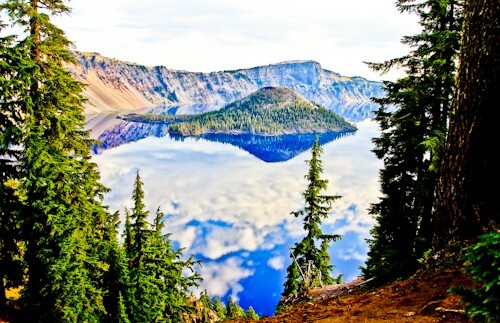 Crater Lake sounds absolutely amazing! That crystal clear reflection is definitely something that doesn’t come by often, normally! I also might have laughed a bit about the squirrel photography and the squirrels posing! Animals are such characters!! Amazing pictures of Crater Lake, we loved your first and the cute squirrel pictures. And you are correct about the weather, you really need to check for a clear day if you want that perfect reflection, we missed one in Switzerland because of bad weather. Crater Lake looks absolutely stunning, I love this little treasures That the US has in the state parks, I have been to Mt. Rainier quite a few years ago, so can imagine how gorgeous your road trip must have been. Oregon and Washington are some of the lushest and prettiest state parks I have seen. Only 7 trees – that’s very interesting! This looks like a beautiful region to visit and doesn’t look very crowded either. I love your picture of the squirrel striking a pose! That is stunning! Crater Lake is one of the places I wish we would have made it to when we were in the Pacific Northwest, but it will have to wait until next time. We loved this area and are glad we have an excuse to return and explore a little more! Always wanted to travel to Oregon. I’ve met a few people from the area and they have only good things to say about the place. I hear it’s really good for the outdoors and I can see by the pictures it’s my kind of place. Such a beautiful place! Gotta add it to my lost of places to visit next time I am in the States! Wauu Crater Lake looks beautiful, you made some really amazing photos!